On a day like this thirty years ago, the first Super Mario Bros. game was released for the Nintendo Famicom in Japan. Thirty years ago was the day the character formerly known as Jumpman became a super star and changed the video game scene forever. This list is a celebration of Mario’s legacy through the funny sound bits that have invaded our ears and hearts for all of our lives. These songs may not be the best or even the most memorable, but these are the songs that for us are what make Mario great. 1-1 may be the most iconic Mario song ever, but it’s not the best, even in its game of origin. Mario’s Underwater Theme perfectly captures the sense of fun and exploration that has come to define the series three decades later. It’s playful and fun and perfectly conveys the nautical theme of the levels it serves, even with the NES’s limited capabilities. By now everyone knows Super Mario Bros. 2 wasn’t originally a Mario game at all, but that doesn’t make its Overworld Theme any less deserving of a spot on this list, especially when you consider this track was subtly reworked for its Mario-themed Western debut. To this day, Mario 2 ranks among the most unique in the series, and this track perfectly captures what makes it so special. Pulling you out of the fun wacky themes of Super Mario Bros. 3 World 1, the moment you encounter your first airship, the musical theme shifts the tone entirely. Those first three repeating chords lay the groundwork of a serious epic adventure through Bowser’s airship army. Nothing conveys the seriousness and balances the fun tunes of a Mario game quite like the Airship Theme. The first handheld Mario adventures didn’t quite measure up to its console brothers, but the funky tunes were still in full swing. World 1-1 has always been a fan favorite and was even used by recording artists Ambassadors of Funk in their song named (you guessed it) Super Mario Land. Mario’s doctorate is questionable, heck, he may not even be have a medical license. Not only does he acts as a pharmaceutical expert in this puzzle game, when Shigeru Miyamoto was asked if he’d let Doctor Mario operate on him, Shigeru quickly shook his head in rejection of his medical prowess. Super Mario World may have one of the most well-designed and compact soundtrack of the series. Every song in the game was composed around a 12 note theme, except certain themes for special occasions, like the ending theme. A celebration of all that is great and beautiful in Mario’s first SNES adventure. Get it? Click! Because it’s a mouse! Before the Blue Shell ever existed, and way before Luigi’s Death Stare became a meme, there was Super Mario Kart, with its basic gameplay that created a whole new genre of racing games. Six Golden Coins was and still is one of the most influential titles in the world of the mushroom kingdom. Created by the late Gunpei Yokoi, Super Mario Land 2 would take Mario to space way before Mario Galaxy did. It also was the debut game for the infamous garlic-munching greedy pigman, Wario. Mario’s first adventure... well at least in chronological order. Way before he could jump or even run without the help of a Super Star, Mario was carried by Yoshi as they both searched for his stranged brother. Super Mario RPG was an insane idea in the ‘90s: Two of the biggest Japanese companies around joining forces to bring their strengths to a single game; the result was nothing short of magical, and Super Pipe House captures that magic perfectly. Yoko Shimomura mixed Kondo’s classic 1-1 theme with sounds inherent to Square’s various RPG series of the day to make something that sounds like it only could have been made by both giants working together, just like the game itself. Water level make lots of gamers nervous, but this chill tune helped us all relax as we dove for Stars, red coins and pesky eel hideouts. Though Mario 64 was the first Mario title where one could drown, so there will always be some darker memories tied to Jolly Roger Bay. Ah, the majesty of winter. The thrill of a race on ice. OH GOD, WATCH OUT FOR THAT PENGUIN! Heard as the overworld theme on Luigi’s Engine Room map in the first Mario Party game, the Engine Room song is one of the best tunes that conveys the frantic gameplay styles of the Mario Party series. It starts out with industrial sounds, loud bangs and clangs, but changes into this silly upbeat tune. A great song to accompany the destruction of friendships. Now, I may be a little biased on this one, since Koopa Park is my favourite hole in Mario Golf for N64, but there’s something that’s just so relaxing on this course. The music is quick and light-hearted, but still calming (which fits well in the often quiet world of golf). Paper Mario introduced RPG elements to a generation of gamers and it helped shape a whole new series for the pudgy plumber. Gusty Gulch is a wonderfully upbeat western track and stands out as one of the best. Many players who haven’t even played Sunshine may recognize this track from the Smash Brothers series, where it plays on the Delfino Plaza stage. It’s just such a merry little island ditty. Mario & Luigi: Super Star Saga - Come On! Mario and Luigi dance to the rhythm of this song... picture it. I don’t need more reasons to pick this song over any other in the Brothers’ first RPG adventure on a portable. Ask anyone why is The Thousand Year Door their favorite Mario RPG title and they’ll give you a million of different reasons. From the intuitive Battle System, to the revamped badge mechanics, Luigi’s parallel adventure and in my personal experience, Detective Pennington. There’s simply not enough love for the Green Missile, which is why we’re dedicating this song to the younger twin. Mario Strikers Charged took everything that was great about original title and turned the dial to eleven. Luigi, being the coolest brother, finally got the treatment he deserved, way before Nintendo dedicated a whole year to his name. Mario goes to the galaxies, bringing a sweeping orchestral soundtrack with him. The game pulls no stops to show how grand this adventure is, and much of the soundtrack forgoes Mario’s usual airy, light-hearted qualities. Even Bowser—who no one usually takes seriously—gets a theme fit for a King. Who knew Bowser, the turtle spiked thorn in Mario’s side could be so personable. Bowser’s Inside Story did so much to make this villain lovable. But this track is a reminder that Bowser, and an over-sized one at that, is not one to be underestimated. In the return to the stars, Galaxy 2 balances the more grim orchestral sounds from the first trip with more playful tracks such “Yoshi’s Star Galaxy”. It’s still space opera though, still grand but at times, more experimental and more alien. Sticker Star may be the black sheep of the series, but it has some redeeming qualities, well… it has ONE redeeming quality: The best soundtrack in the whole Paper Mario series... and a fight against a flamenco-blooper that loves to clap to the rhythm of its battle theme. Nine years and four titles later... The New Super Mario Bros. series is now despised by fans of the plump plumber. What went wrong? Well, everything that made the original title charming simply expired, the “bahs” in the soundtrack were cute no more, and the level design became too simple. Luckily for everyone New Super Mario Bros. U brought enough new content to keep the series relevant. Arguably the most feel-good, laid-back, sun-lovin’ song in Super Mario 3D World. This song stands out to me from the rest of the big band sounds found on SM3DW’s soundtrack for it’s ability to actually make feel like you’re relaxing on a beach in the tropical sun. There have been plenty of ghost tracks in Mario Kart’s past, but none this catchy. And spooky! We have a lot of scary tunes on our list, and that’s just because Mario does ghost levels so well. And so we close this list with Mario’s most recent outing, a game unlike any other. Everyone that was influential in the creation of the title that started it all 30 years ago was brought back, including Koji Kondo. Like the best chefs in the world take a classic and presents them in a unique andunexpected way, Kondo de-constructed the songs from the Mario games and gave them a unique feel, immortalizing them for a second run. Songs like these are the reason why Koji Kondo was summoned for Super Mario Maker. Just like the title that started it all thirty years ago, the level creation tool needs no introduction. Here’s hoping for another 30 years of adventures in the Mushroom Kingdom, these 30 songs represen..... wait... Are you telling me there only 29 songs in this list? This is why Luigi is the better brother. Scared as all heck but finds the time to whistle a tune in line with a charming song that eerily plays throughout the Haunted Mansion’s halls. Plus he saves Mario. Take that red ‘stache, and Happy 30th Anniversary. Happy 30th Anniversary, Super Mario. Thanks for brightening up our days for all these years, and many more songs to make our hearts dance. 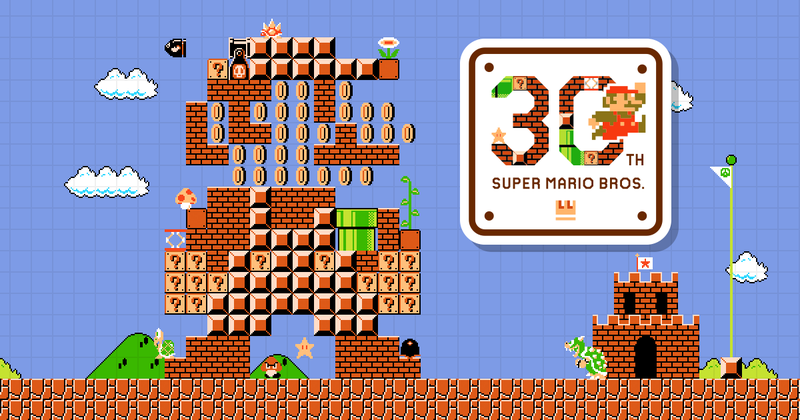 Feel free to share your favorite songs and games in celebration of Mario’s 30th anniversary too. Follow the authors of this post on Twitter: Peach @nach212, Toad @Zarnyx, Luigi @SuperBentendo, Mario @SteveBTAY and Yoshi @EvanChambers.